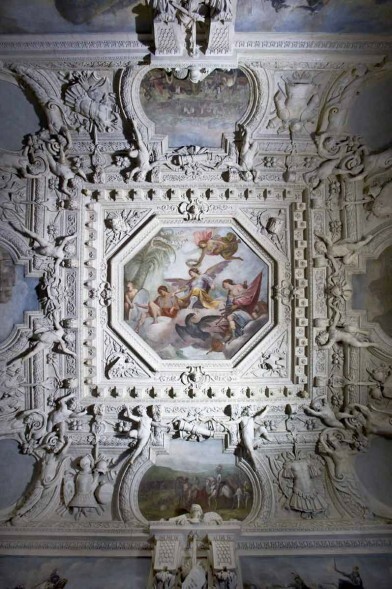 This room was already endowed with a brocade tapestry in 1644 and was probably the last room to be decorated by the Bianchis and their team, as we know Pompeo and Francesco were paid in 1645/46 for their stucco work on the ceiling. 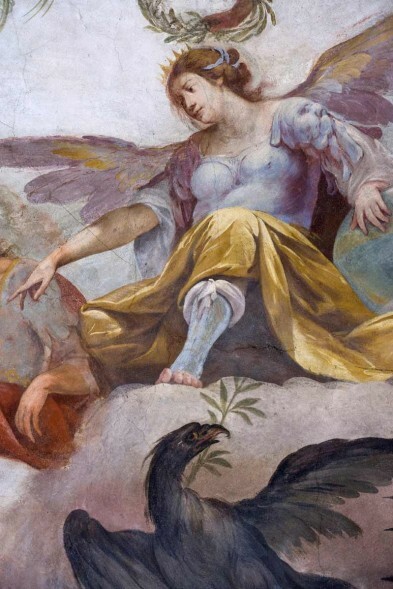 From this point on the stucco-work became more important in the Valentino apartments than had previously been the case, connecting iconographicaly precisely to the subject matter. 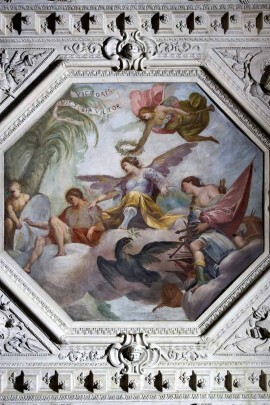 The general frameworks on the ceiling of the War Room are similar to those in the previous rooms as, for example, the four-cornered cornice and corbels decorated, alternately, with roses and framed Fleur-de-lis; the separating border defined by egg moulding above pairs of corbels on acanthus leaves; and lastly the lobed frames of the fresco paintings. What seems decidedly new is the plastic exhuberance of the pair of putti joyously holding up war emblems above the fresco paintings featuring the military feats of Vittorio frames I. The stucco-work of the frames around the great paintings is very lively with military symbols like shields, helmets and panoplies (suits of armour). The theme of this room is closely linked to the celebration of Vittorio Amedeo I, who the central octagonal plaque addresses: “VICTORIS VICTOR! VICTORIA”. It is also possible to find a more general reference to the military virtue which a prince should aspire to, especially as Carlo Emanuele II was approaching age the was fourteen on 20 June 1648). This apartment was destined for the young heir to the throne and the stucco in these rooms described the typical life style of a prince: hunting, ceremonies and political activity. In each of the rooms in this apartment there is an abundance of white stucco-work which indicates a approach to design, very different from that of the Bianchis. The style is Alessandro Casella’ s as he was probably working autonomously here at the time. This white stucco-work could emphasise and subordinate or isolate, the individual events of the fresco paintings. 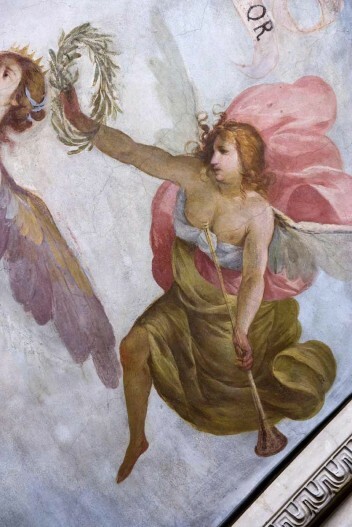 The frescos, in fact, were completed altogether, at a later date, by Gian Paolo and Giovanni Antonio Recchi, leading members of a skilled crew from Lugano and employed at the Valentino from 1662. The War Room features the ‘Vittoria incoronata dalla Fama’ (Fame crowning Victory) in the central painting, while the Genius of History writes about his heroic fests on a large shield. 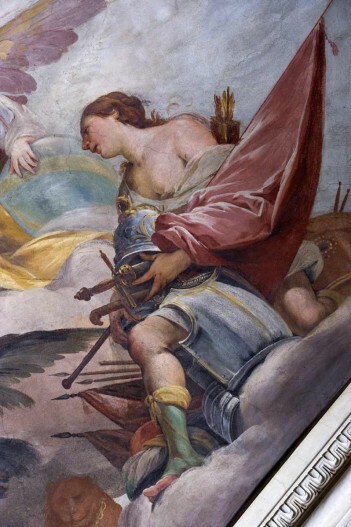 It is possible to recognise glowing praise shown to Vittorio Amedeo I by the presence of his coat-of-arms, the Bird of Paradise, and the four paintings on the lower parts of the wall showing his military feats. Thanks to the analogy with some scenes shown in the Cathedral of Turin, during the funeral procession of the Duke, which had been copied in engravings by Giovenale Boetto, you can identify events that occurred during the War of Monferrato, such as The Siege of Crevalcore and The Conquest of Bestagno. 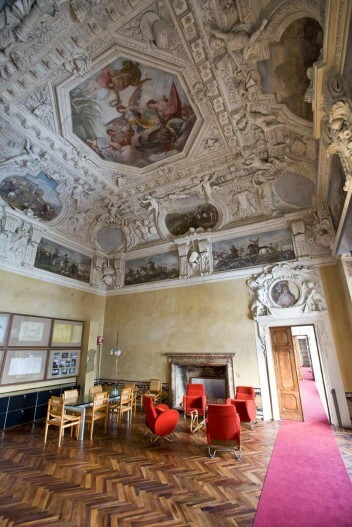 Alessandro Casella designed the doors in this room, with portraits of Vittorio Amedeo I and Cristina of France above them, and which Vico had already noted, but have only reappeared now after recent restorations. Il tema iconografico della decorazione è strettamente legato all’esaltazione di Vittorio Amedeo I, cui allude la scritta nel fastigio dell’ottagono centrale “VICTORIS VICTORI VICTORIA”. Il riquadro affrescato raffigura la Vittoria incoronata dalla Fama, mentre il Genio della Storia scrive i suoi fasti su un grande scudo. Il tema iconografico della decorazione è strettamente legato all’esaltazione di Vittorio Amedeo I. 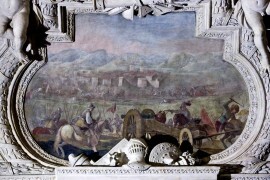 Scene di battaglie che alludono agli episodi del Monferrato si alternano a decorazioni in stucco che rappresentano armi e corazze incrociate.